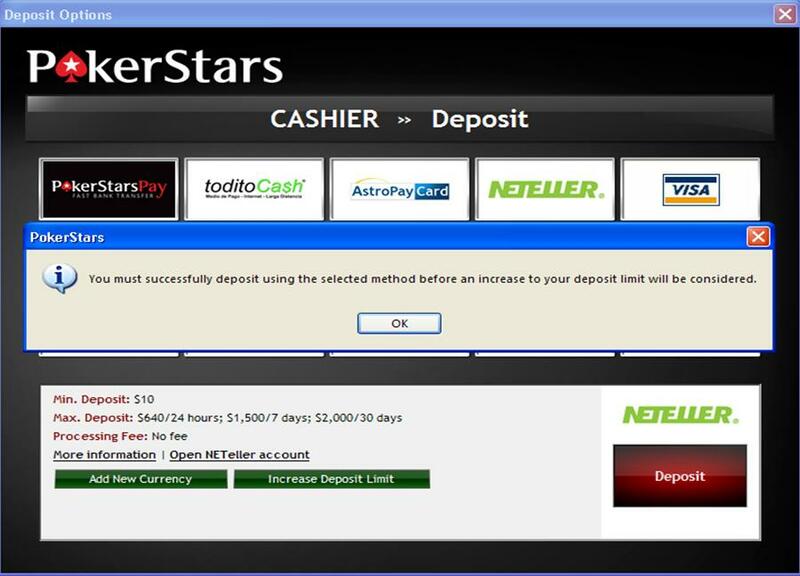 The best way to send your documents is via the PokerStars Client. Once logged in, please navigate to Help/Contact support (via the Main menu in the lobby). Here you can browse to files on your computer and upload them directly to us. Please ensure you select the correct category ‘Security’ > 'Age Verification’. 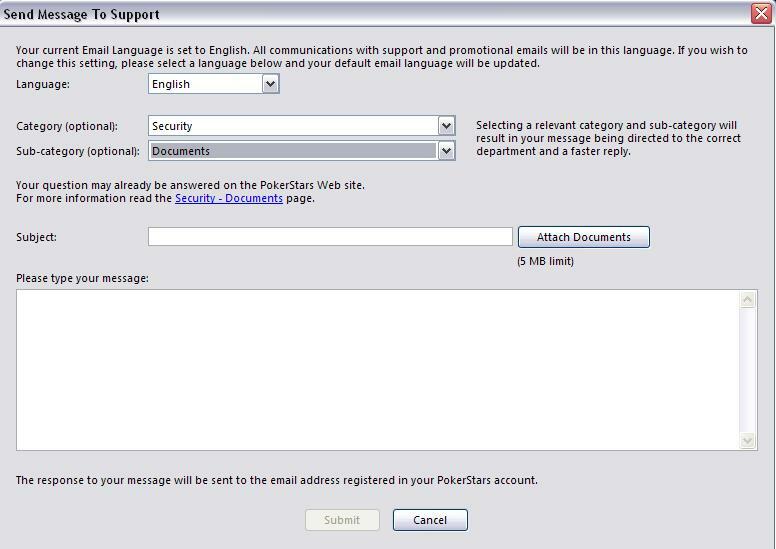 You can also send documents by email to verification@pokerstars.uk using the email address associated with your PokerStars account. I feel unsure about sending verification documents to PokerStars. If you are unable to increase your limits via the software then you will need to contact Security for your request to be reviewed. Please email your request to security@pokerstars.uk together with a scanned copy of your Government issued ID, and copies of your credit card and bank statements if you use the following deposit methods: Credit Cards (VISA, MasterCard etc). If you do not know the reason for the return, please contact paymentservices@pokerstars.uk for assistance and more information. We try our best to provide accurate descriptors, however on rare occasions our payment processors change these descriptors without warning. Please contact paymentservices@pokerstars.uk if you see an unusual descriptor on your bank statement that you believe may relate to a PokerStars transaction. Please also be aware that your financial institution may abbreviate the descriptor. 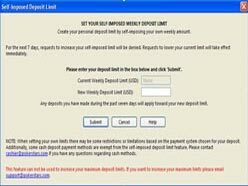 If your eCheck deposit is not available for you to play it is possible that you had a return in the past and thus your deposit will not be available for you to play until after 10 days when it has fully settled into our account. 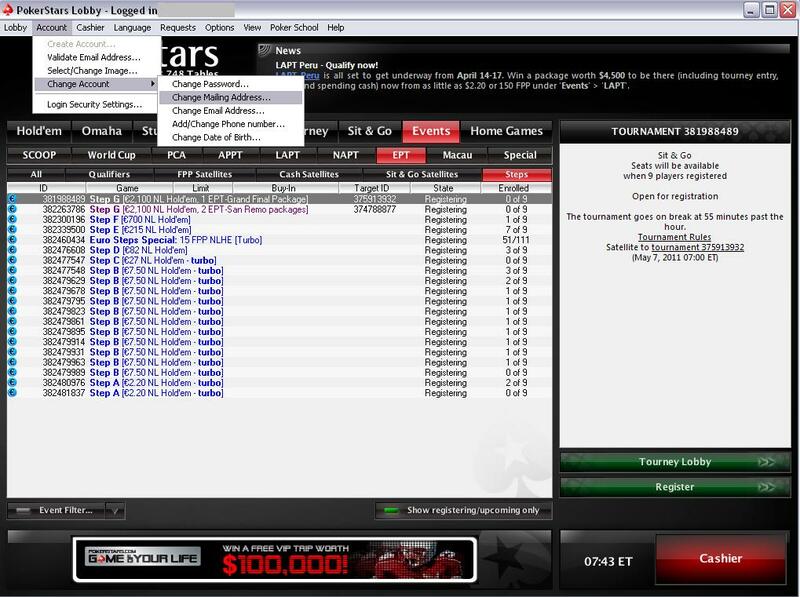 Please only email security@pokerstars.uk if none of your previous deposits have been returned. Please send an email to security@pokerstars.uk with the subject line ‘Remove eCheck account information’ and we will assist you further. 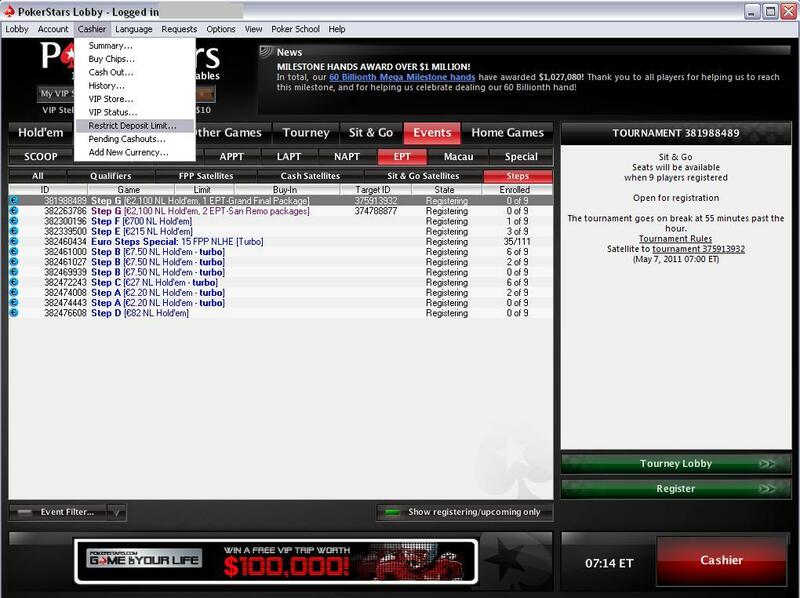 On PokerStars it is NOT permitted to cash out directly from transfers received from other players. To enable us to swiftly handle your request, please email security@pokerstars.uk from your registered email address, explaining the reason why the method in question is no longer available to you and/or why you wish to block such method. 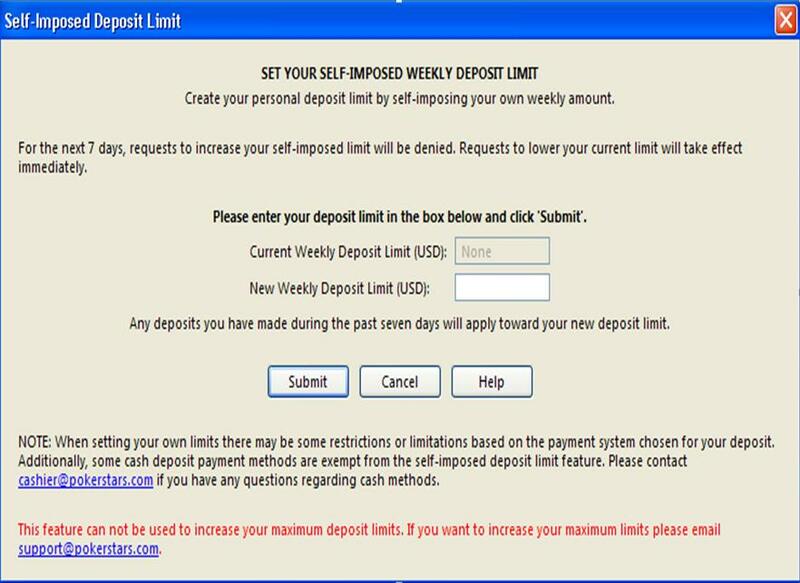 Please do so before you submit your cashout request and be advised that that once a deposit/cashout method is blocked, you will NOT be able to use again that particular account /method within the PokerStars system. I will be submitting my cashout request from a country other than the one registered in my PokerStars account. Is there anything I should do? 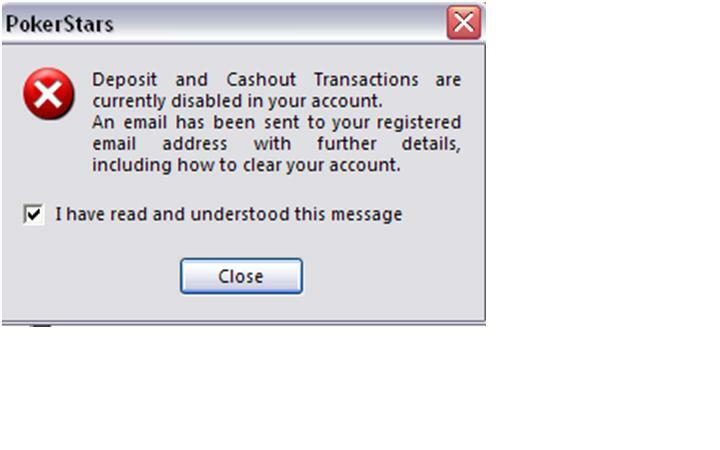 Before submitting your cashout request we advise that you first email security@pokerstars.uk from your registered email address explaining the reasons behind the likely country mismatch. 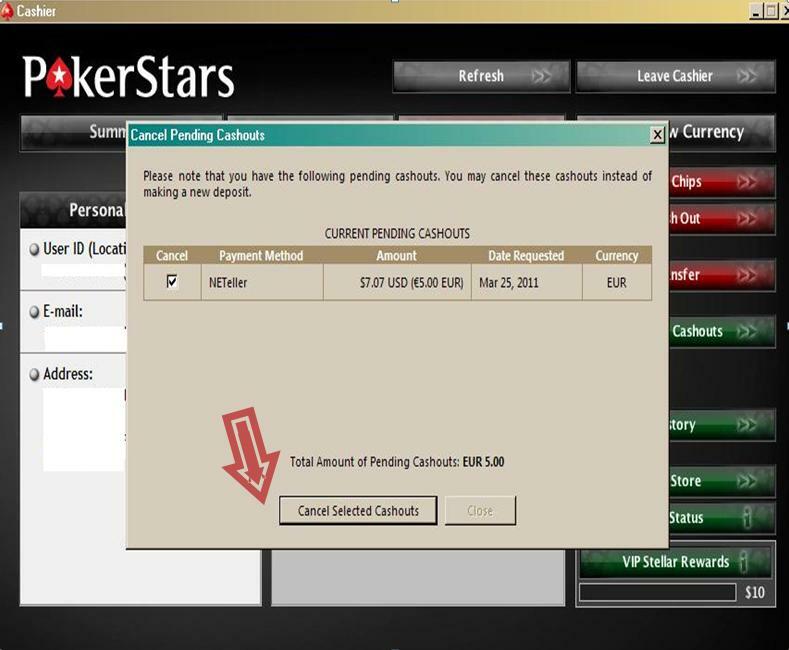 Simply log in to your PokerStars account, visit the Cashier screen, select the ‘Pending Cashouts’ and then the 'Cancel Pending Cashouts' option, which is found under your personal information table. You will be presented with a list of your pending cashouts. 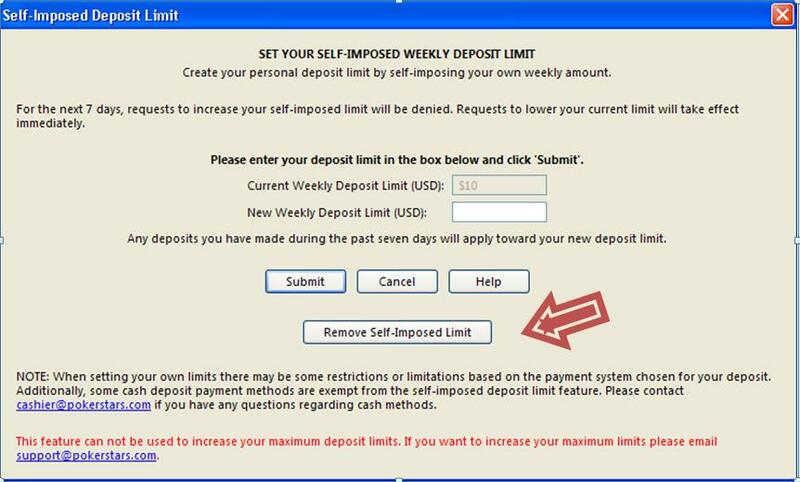 Select the transaction(s) you wish to cancel and click on the 'Cancel Selected Cashouts' button. 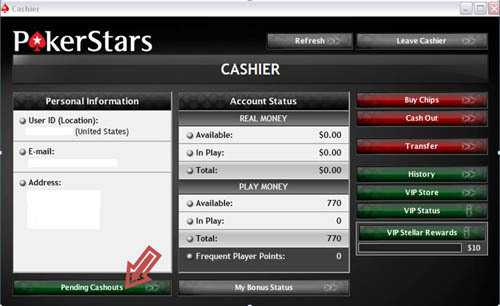 log in to your PokerStars account, visit the Cashier and select the 'Buy Chips' option. You will be presented with a list of your pending cashouts and the option to either cancel them or continue with a new purchase. Select the transaction(s) you wish to cancel and click on the 'Cancel Selected Cashouts' button. (See above screenshots). I am unable to locate my cashout in my PokerStars account transaction history and I have not received notification that the request was cancelled. Cashouts to VISA will be automatically converted by PokerStars from your PokerStars account currency into the currency of the most recent CFT eligible VISA deposit. 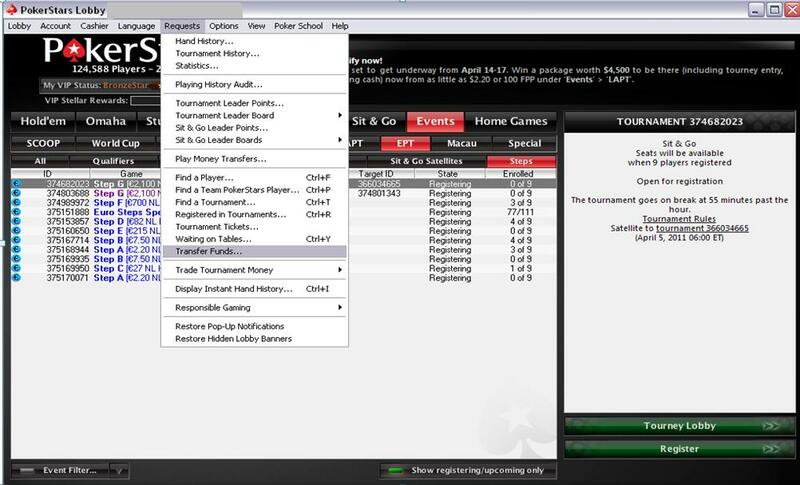 How can I make a player to player transfer from my PokerStars account? To request a transfer of funds from your account to another player’s account on PokerStars, simply log in and navigate to ‘Requests’ > ‘Transfer Funds’ from the main PokerStars Lobby (as illustrated below) and follow the on-screen instructions. Your request may require a phone or email confirmation. Please check your inbox to see whether we have sent you an email about the queried transaction and ensure you have updated telephone contact details listed in PokerStars account. 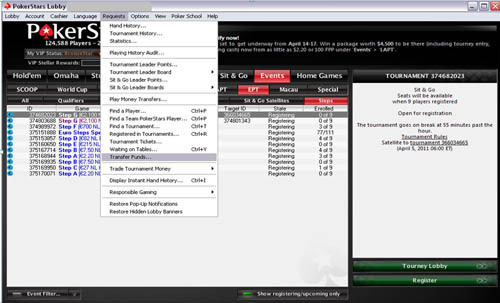 You will be able to check this information yourself by logging into your PokerStars account and navigating to the ‘Cashier’ > ‘History’ tab in the Main lobby (as illustrated below). Log into your account via the PokerStars Client. We will attempt to reverse the transaction but we cannot guarantee that this will indeed be possible. 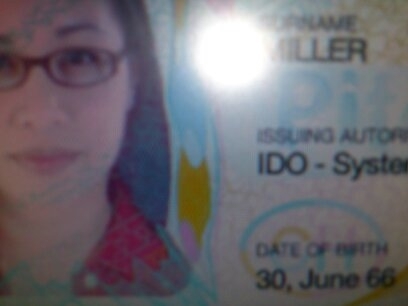 Players are ultimately responsible for ensuring that they entered the correct details of the intended recipient. Please email security@pokerstars.uk as soon as possible with details of the transaction (date, time, amount and the User ID of the recipient). 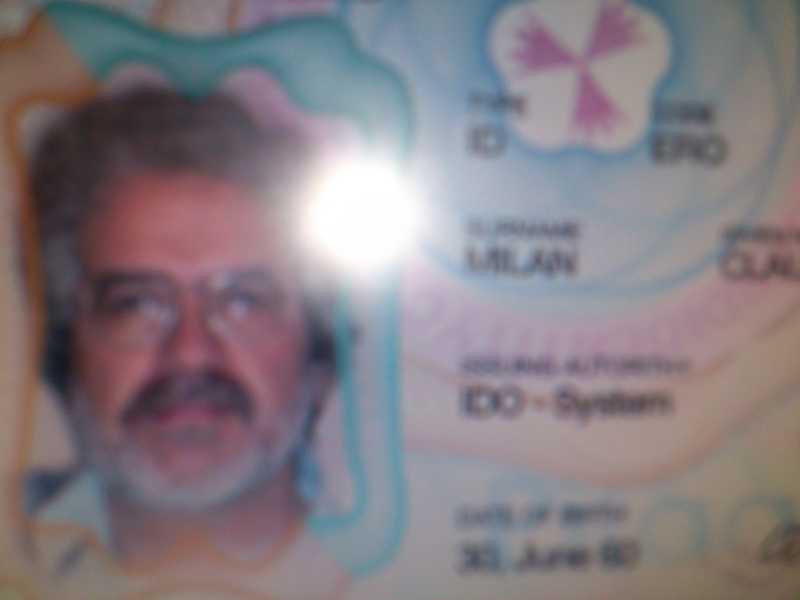 What must I do to change the registered country in my PokerStars account? 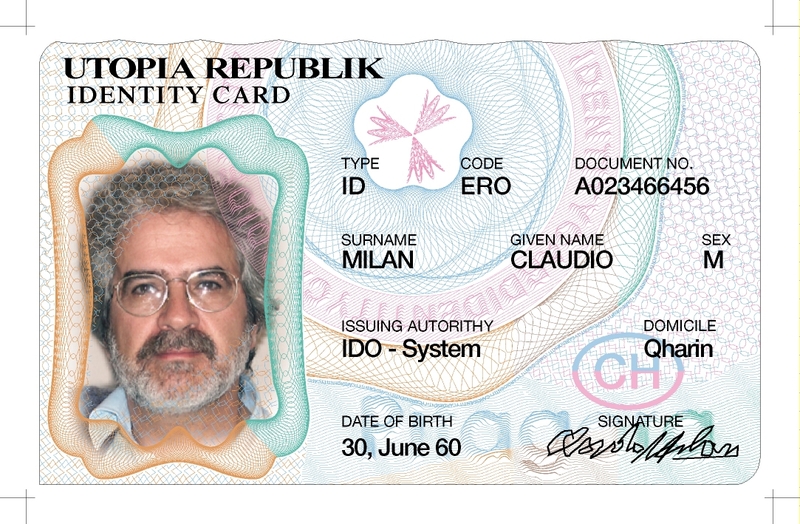 To change the country registered in your PokerStars account, we kindly ask you to upload via the PokerStars Client a copy of your government issued ID and a valid proof of address showing your name and address in the new country of residence. 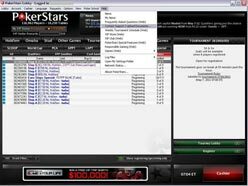 How can I update the registered home address in my PokerStars account? Alternatively please email us the document requested at security@pokerstars.uk including the same subject line and explanation mentioned above. To enable us to swiftly handle your request, please email security@pokerstars.uk from your registered email address stating ‘Remove bank account information’ in your subject line. Please email support@pokerstars.uk requesting to have your account closed and including the reason behind your decision. 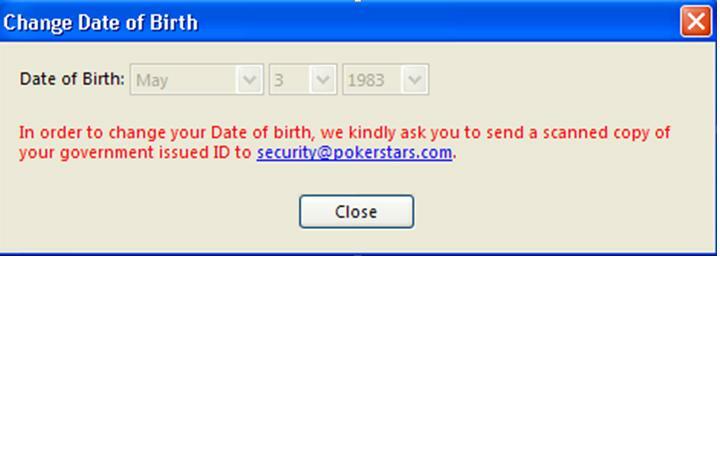 We currently offer a PokerStars PIN (formerly called Secure ID) that you can enable on your account for added security. Moreover, you can order an RSA Security Token through the PokerStars VIP Store. The RSA Security Token will help to combat key loggers by requiring someone attempting to access your account to have the RSA Security Token physically with them, thus upgrading your account security to a 'two factor authentication' - password and RSA generated code. Please send an email to support@pokerstars.uk with the subject title ‘Collusion report’ and an investigation will be conducted on the reported accounts. Please send an email to support@pokerstars.uk with the subject title ‘Multiple account report’ and the player(s) reported will be investigated. Appropriate action will be taken should we find that the accounts reported belong to the same player, however for privacy reasons, we will not be able to disclose any information to you about actions taken. PokerStars will never ask you for your password in an email. The only place where your PokerStars password will be requested is in the PokerStars software. If you have any doubt about the authenticity of an email, please forward it to support@pokerstars.uk and you will be advised if the email is genuine. Please contact security@pokerstars.uk quoting the error message ‘71/1001’ in the subject line for assistance regarding this issue. Please contact security@pokerstars.uk quoting the error message in the title and attach the PokerStars software log files to your email. To retrieve your log files, please load the PokerStars Client (Note: login is not required to carry out this action). Since security@pokerstars.uk has failed to reply, I will email another department. If you are experiencing any problems with repaying the balance owed, then please email collections@pokerstars.uk for assistance. If you establish that the funds claimed have been debited from your account then please email collections@pokerstars.uk for assistance, ensuring you also provide a scanned copy of your bank statement.